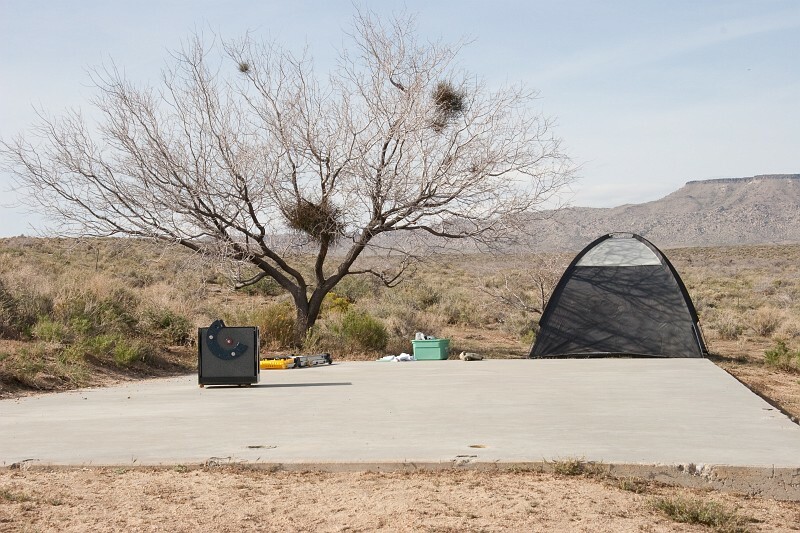 Last year in October, Jane met herpetologist Hanna Strauss at an event in Mojave National Preserve, and the two of them resolved to get together again on a new moon weekend. We did that this past weekend, the new moon weekend of April 2009. 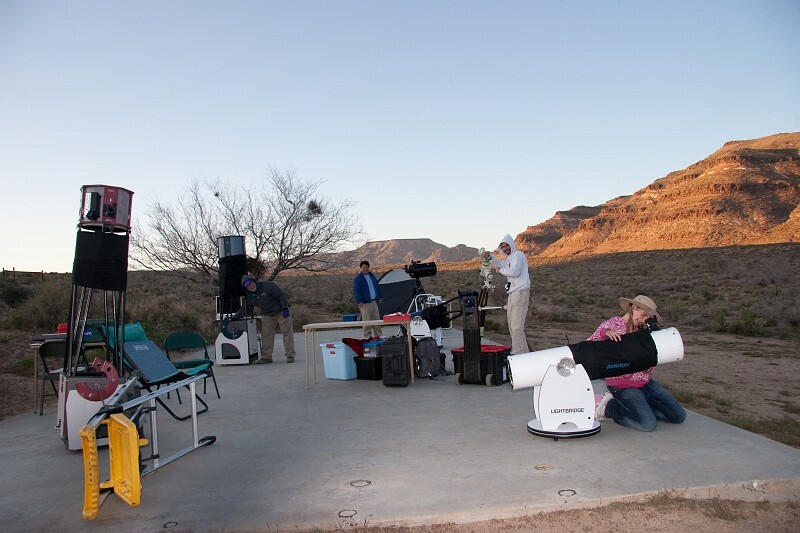 "Telescope Pad" and our tent set up Friday evening at Black Canyon Group Camp. Jane and I departed Monrovia on Friday, April 24, just before noon, and were the first to arrive at Black Canyon Group Camp at about 4:00 p.m. The astronomy forecast for Friday was pretty bad; there was a persistent thin layer of clouds that made the sky a little more like Los Angeles sky than desert. We were able to coax out some fair views of Saturn and some of the bright double stars. Jane went out “herping” with Hanna and came back to report finding several varieties of snakes on Black Canyon Rd. The worst part of the evening was the wind. We knew it was coming; it was all over the forecasts. I was first to climb into my tent with the wind not being too bad, but around midnight, it really turned into a gale. Jane and I were warm and comfortable in our sleeping bag, and the tent was firmly staked down, but there was little sleep to be had that night! We could hear the gusts approaching, echoing off the smooth canyon walls, sounding a little like an approaching jet. It went on ’til almost sunrise. The tent managed to hold up, but our old tent already had a front door zipper that would not close well, and our front door was soon hanging by a couple of zipper pulls. Fortunately the door was facing away from the wind. The stakes held all night. I kept half-expecting the tent to rip apart, but it held. The wind would blow it almost horizontal onto our heads. A few equipment boxes lost their lids. Amazingly everything was recovered, and nothing seriously damaged — though we heard the next morning that our telescopes were blowing around like weather vanes. Aligning finders using yucca plants on the distant mountain ridge. Big groups are difficult to keep to an early schedule, and the lizards won’t wait. We got everyone together for a walk across the road to Hole-in-the-Wall. We found several small lizards, and had fun crawling over the interesting formations. Several of the group took off to explore Mitchell Caverns, and Jane and I joined another group to drive through the park. We stopped along the way at a dense joshua tree forest, at the Kelso Depot, and walked the Kelso Dunes trail. After visiting Baker for ice cream and gas, we drove back on paved roads (94 miles) to the group campsite. This evening was looking a lot better for astronomy. The sky was crystal clear. The seeing forecast was poor, but the actual seeing was good enough to see dust lanes in galaxies. Everyone enjoyed seeing Saturn, of course. I really enjoyed seeing a strong zodiacal light in the dark transparent sky. The site is very dark, with a fairly strong light dome to the north from Primm. It’s galaxy season, and I enjoyed showing the big Ursa Major galaxies M81 and M82, the bright Leo pair M65 and M66, beautiful edge-on NGC4565, face-on spiral M51 the Whirlpool, M104 the Sombrero, and the Virgo galaxies near M64 and M66. Tortoise three has been chowing down, or likes green lipstick. On Saturday evening, I didn’t go out herping. The group that did came back saying they’d been skunked. “What, you found skunks?” I asked. No, they hadn’t found anything! 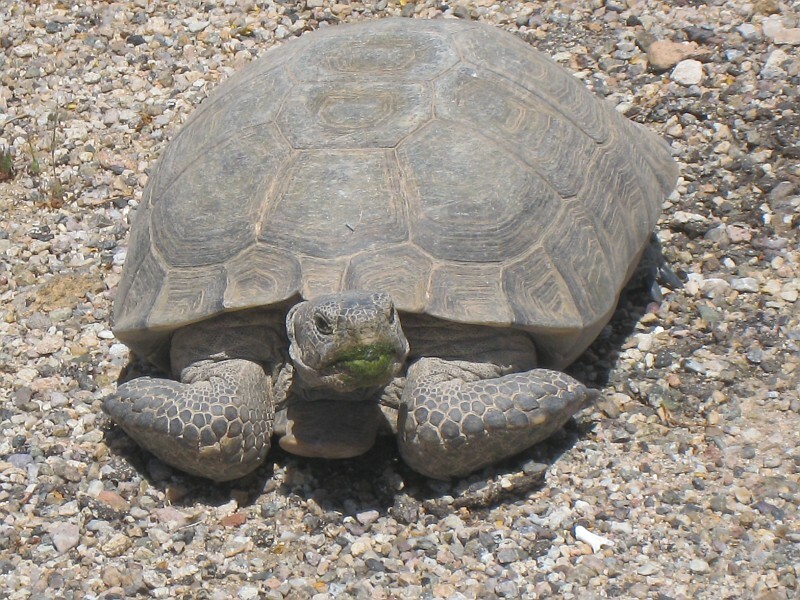 So we’d spent the whole weekend without seeing any of the desert tortoises Mojave National Preserve is famous for. It hardly mattered, as we’d had an adventurous and interesting weekend with great company. On Sunday morning we were among the last to be packed and ready to go along with Gary and his daughter Catherine. Jane was driving, and we were heading out of the park down Black Canyon Rd. We both saw a tortoise naively sitting in the oncoming lane about four miles from Hole-in-the-Wall. Jane quickly stopped, as did Gary behind us. We debated what to do with a tortoise not wanting to move, sitting right in the middle of a traffic lane. We vowed to see him safely off the road, and fortunately there was no traffic. Eventually Jane was able to help him off the road, and we left him in safety. Two more times we stopped for tortoises on Black Canyon. These two were up and walking around, and out of harm’s way at least for the moment. Everyone got pictures, and Jane took some great video. Once more we stopped for a tortoise shell on Essex Rd. before leaving the park. This one turned out to be a decoy, with a flier attached advising motorists to keep an eye out for tortoises on the road, and drive carefully and slowly through the park. Jane and I both shot a lot of pictures over the weekend. It’s not art-house photography by any means, but there are a lot of fun pictures. I enjoyed making a couple of panoramas: one of the group camp before anyone else arrived, and one of the Kelso Dunes from the dunes trail. With the laptop in the car, I was able to make panoramas and start the photo album. I uploaded a first draft from a Starbucks in Barstow. On Sunday Jane shot some short videos of our three tortoises. The first tortoise wasn’t terribly interesting, just sitting in the middle of a traffic lane. The other two, included in the album, are quite animated and fun to watch. One short epilogue about our Friday night gale. Our valiant tent kept us protected; it bent but never broke. It did have a funny shape on Saturday morning. When I took it down on Sunday, a couple of the metal sleeves that hold the support rods of the tent had deformed. It’s time for a new tent. Saturday night was too cold for the reptiles to be out on the road, but those of us who went roadcruising Friday night were successful. We saw a young Mojave Green Rattlesnake, three Glossy snakes (a baby, and two larger ones) two long-nosed snakes, and a sad sight – an injured California Mountain King Snake. Plus a western banded gecko, many desert jackrabbits (Black-tailed hare) and cottontails (Audubon cottontail), and night hawks catching the bugs our headlights illuminated. Lots of mice too crossing the road at night. Panoramas is dependent on image size, image quality and the zoom level of the source photographs. The algorithm can correctly resolve the visibility without making use of any depth information. It is especially useful when depth information is notavailable, such as in the case of real-world photographs.